When I was pregnant with our first little girl (now 3 1/2), I made a commitment to use cloth diapers. I kept picturing the enormous heap of thousands of diapers that would just sit here on our precious earth LONG after the end of our lives. We're still using cloth diapers for our 15 month-old twins, and for a while, we had all three kids in cloth diapers. I can't believe that I just figured out this part of the system now! 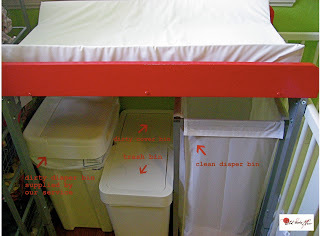 We use a great diaper service based in Pasadena, which is a great deal when you have more than one kid in diapers (I haven't made the leap to washing the twins' diapers like I did for our oldest). 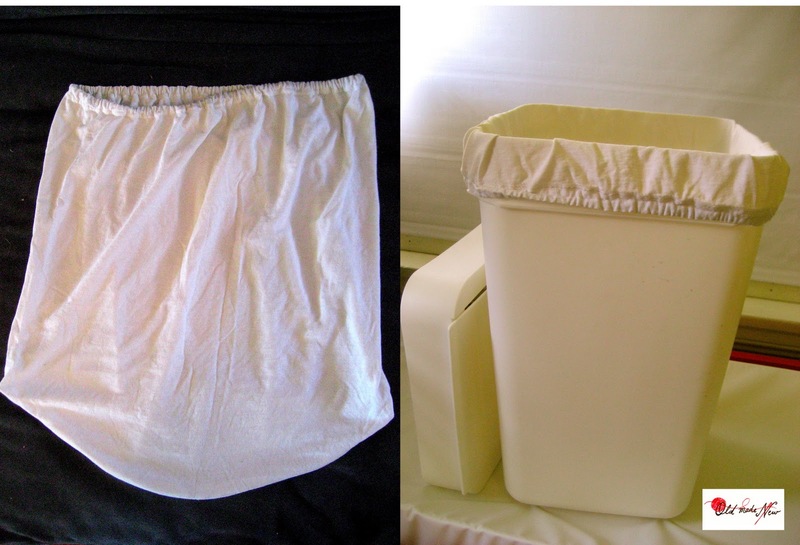 While we don't have to wash any diapers, we are still responsible for washing their diaper covers, which get pretty gross. I've always had a separate bin to keep them in until I accumulate enough for a load, but the can would always get disgusting! 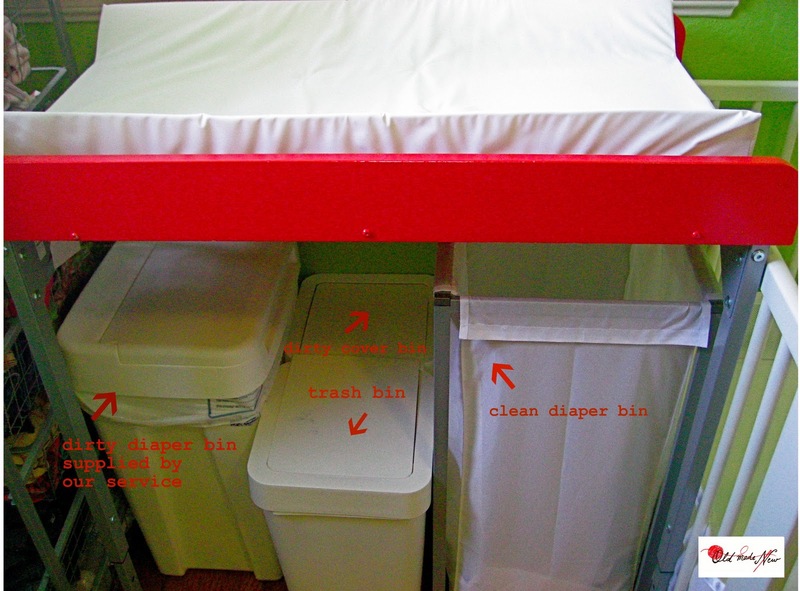 I never lined it because it always seemed like such an unnecessary use for a plastic garbage bag. I recently realized that I needed a liner that I could pull out of the bin and throw into the washer with the dirty covers...DUH! Anyway, I looked around my house, of course, for materials that I already had....an old t-shirt, thread, and elastic. I started my cut at the armpit and rounded up toward the neck to get as much room in the bag as possible. I stitched up the rounded, cut edge and added elastic to the other end. 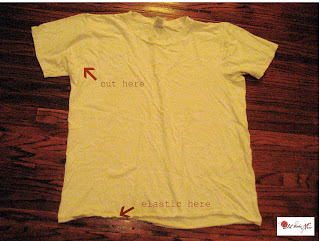 One great thing about making things out of t-shirts is that there is a built-in elastic casing. 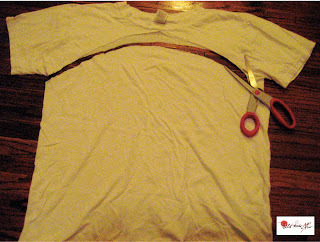 Just snip a little slit, shimmy the elastic all the way through, cut it to size, and sew the two ends together. 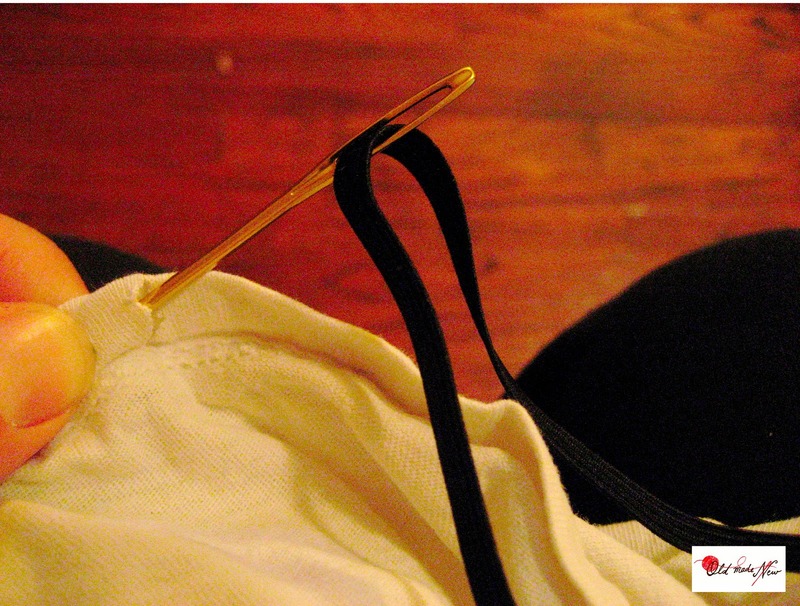 I like to use a tapestry needle to thread elastic. It's long and easy to maneuver, with a large eye built in that accommodates bulky elastic. Here is our hard-working diaper station. 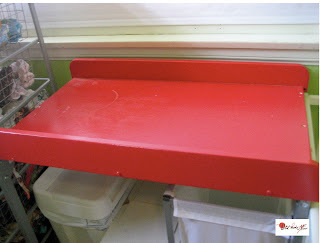 The changing table top is built from an old IKEA cabinet door and side supports from an old IKEA spice rack. It sits on legs that attach to the wall. Anything that I can do to make my work at home more efficient makes me really happy. Brilliant!!! I'm working on a post on how to reuse old t-shirts, so I'll link to your DIY if you don't mind! I'm glad you like the idea. Sure, you can link to this post! Thanks for asking. I'm very new to the blog world, and I'm still figuring out how this all works.